Search for your Big Find: We are working as fast as possible yet hundreds of items must be photographed. Please e-mail your request  we may have just what you are looking for! Acceptable payment: Money Order or PayPal. Contact hope@thebigfind.com for additional information. This very rare double sided server is from the Iquitos Steamship Company and marked Walker & Hall, Sheffield, England on the back. 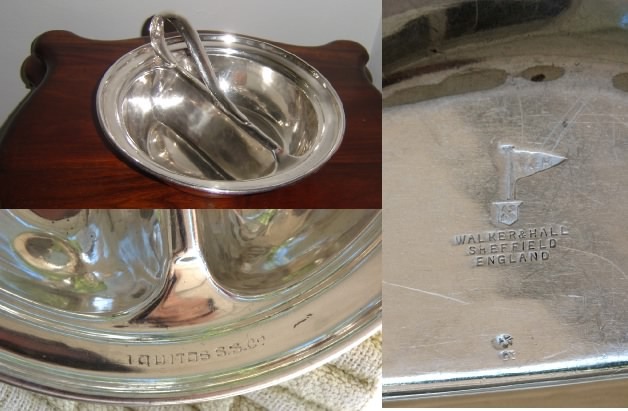 It is silverplate and I am guessing it was made between 1885 to 1900. Under the hallmark of a flag with the initials W & H there is a shield with an X like mark. The double server, for lack of a better word, is large, with a circumference of 12 inches, each serving side in 3 inches deep, including the handle it is about 6 inches high. It weighs about three pounds. HISTORY: In 1869 R. Singlehurst & Co. Ltd., of Liverpool who had traded sailing ships for many years to northern Brazil, founded the Red Cross Line. This was in direct competition to Alfred Booth & Co., but in 1870 agreement was reached to share the trade. A fortnightly service being instigated. In 1897 the Red Cross Iquitos Steamship Co. Ltd., was formed by Singlehurst's and a direct service from Liverpool to Iquitos, Peru was introduced for the first time. In 1901 the Singlehurst family decided to withdraw from operating their own fleet. The two companies amalgamated under the name of The Booth Steamship Co. (1901) Ltd. From the amalgamation of the Booth Iquitos Steamship Co, Ltd. and the Red Cross Iquitos Steamship Co, Ltd. was born The Iquitos Steamship Co. Ltd. In 1911 The Iquitos Steamship Company was absorbed into the main Booth fleet. 1941: Transferred to the Panamanian flag. Captured by the Japanese at Singapore. She was declared a War Prize by the Sasebo Prize Court and renamed the Ekkia Maru. Sunk: 8/09/1944 by US aircraft southwest of Manila. Since the ship was apparently sunk in 1944, I am not sure how many serving pieces made it off the ship from its heyday prior to 1911 when it was transferred to the Booth Line. NOTE: This server is rare and old, and has a slight ding in it. Considering the thinkness and soildness of it, it was hit or banged with a might blow. Acceptable payment: Money Order or PayPal. Contact hope@thebigfind.com for additional information.